The Winnipeg Jets wives and girlfriends will help raise funds in support of Can Do People with their second annual charity endeavor, this year, creating holiday cards. All holiday card packages will come with seven cards in each set and there are four different sets of cards, each available for $14.99. The card sets will be on sale at all Jets Gear locations starting tomorrow. Winnipeg Jets’ players along with their families helped create their own unique card, whether that be a photo of from their youth or an original drawing created by the player or their family. 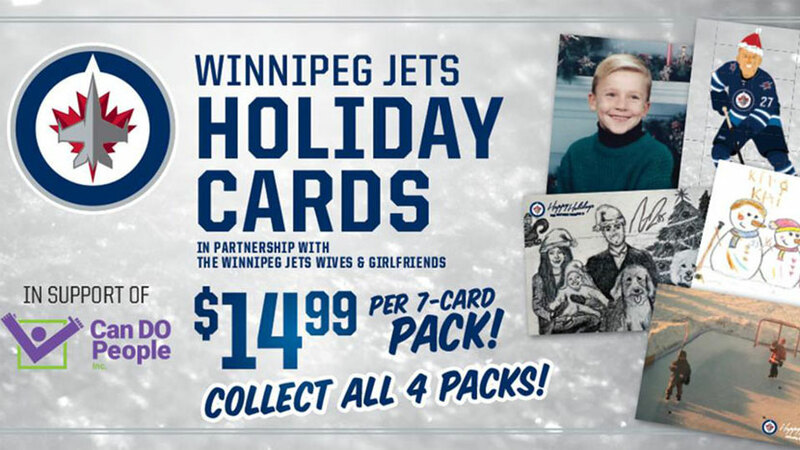 The wives and girlfriends will also be on MTS Centre concourses selling the holiday cards for Jets’ home games on November 27th and 29th. Each year, the wives and girlfriends will partner with a registered charity within Manitoba and work together with the charity to increase awareness for its cause. It is anticipated that the holiday cards will help raise $15,000 for Can Do People. Can Do People believes that learning is a life long journey. Their mission is to provide a safe, rich environment conducive to the best practices for individuals with Autism Spectrum Disorder, other intellectual disabilities or exceptional behaviours. They promote and foster the growth of each individual to enable them to lead fulfilling lives and be contributing members of society.